Last Aug. 8, 2018 (8-8-18), beep had its 1,000,000,000th transaction in the light rail network (LRT 1, LRT 2, MRT 3), just two months short of its third anniversary in the market. Of this number, 56 percent are beep card transactions while 44 percent are cash via single journey tickets. However, the trend in the use of beep cards is still increasing – in July 2018, some 59 percent of fares were paid using beep cards. “Reaching this milestone is a testament that we were able to create a robust and dependable payment solution for mass transit that has brought convenience to millions of the city’s rail riders over the last three years,” said Peter Maher, president and CEO of AF Payments Inc., the consortium behind beep. 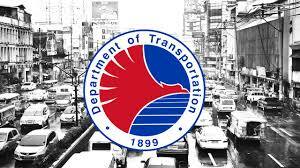 The Ayala Corp.-Metro Pacific Investments Corp. consortium won the permit to operate an automated fare collection system as a Public-Private Partnership project in 2013. “Our team works day and night in partnership with the DOTr and the rail operators to ensure that the system meets the demanding performance standards set out in the Concession Agreement,” Maher said. Strong online and on ground support helped customers easily adapt to the new system. Even commuters attest to the improvement of their journey in the elevated trains because of the beep card. Aside from time saved in falling in line, commuters enjoy seamless transfers between train lines and automatic savings for most rides, among others. Nicko Abeleda, who frequently rides the LRT 1 from his home in Malabon City to his workplace in Makati, finds it convenient that he can proceed to the turnstiles and tap his way to the train. “Mas madaling gamitin yung beep card kasi ita-tap mo lang. Mas mabilis kaysa sa magnetic card dati na hindi mo agad alam kung aling side ipapasok. Kumpara naman sa SJT, malaking bagay ‘yung natitipid kong seven pesos bawat LRT ride kapag beep card gamit ko (It is easier to use the beep card because you just tap it, unlike the previous magnetic card. Also, compared to the SJT, the savings of seven pesos per LRT ride is a big help for me),” he said. Meanwhile, Charisma Geminiano, who frequently rides the LRT 2 and MRT 3, appreciates the easy transfer between rail lines that the beep card made possible. She finds it convenient not having to line up twice to get tickets. “The beep card saves me time because I can load the amount that I need for a week or month. I can easily use the loading machine instead of lining up at the counters, where queues are usually longer,” she said. Some commuters even note that having a beep card is more hygienic since it lessens the need to fumble with cash, particularly coins, which have been previously handled by so many people. Others are pleased that the beep card is user-friendly for all members of the family, even for senior citizens who get to enjoy their 20 percent discount with their beep Concessionary Card. Recently, beep launched a mobile app which enables cardholders to check the load and transactions on a daily basis for up to five cards. The app is available for FREE in the Apple App Store and Google Play Store. Over 5 million beep cards have already been sold. Aside from the LRT and MRT, other modes of transport accepting payment via beep card are the point-to-point buses of Froehlich, HM Transport, RRCG, TAS Trans, and DNS, as well as the BGC Bus, Citylink Coach Services, Lancaster New City shuttle service, and BBL Trans (Balibago-Buendia route). For more information, visit the website and official beep™ card Facebook, Twitter, and Instagram accounts. 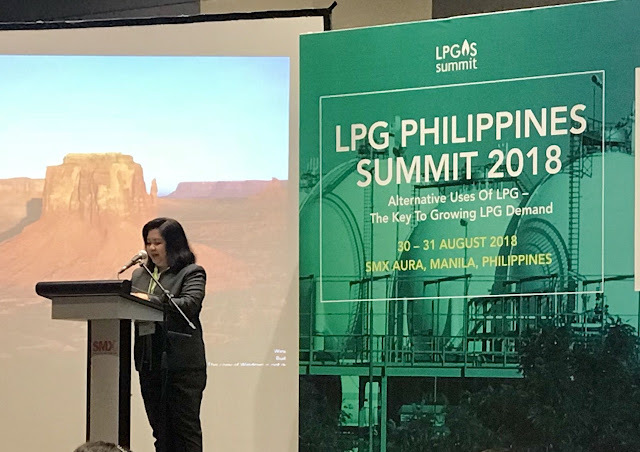 The Department of Energy - Oil Industry Management Bureau (DOE-OIMB) Assistant Director Rodela I. Romero delivered the opening remarks of Assistant Secretary Leonido J. Pulido III yesterday (30 August) at the launching of the two-day LPG Philippines Summit 2018 at the SMX Convention Center Aura, BGC, Taguig City. The LPG Philippine Summit is a venue for the government and the private sector to share valuable information and unified strategies in addressing the numerous concerns of the growing Liquefied Petroleum Gas (LPG) industry in the country. “The DOE calls on our LPG industry players to be guided by the existing government rules and policy directions to provide fair competition and consumer protection. Our goal is to help the consumers get a good deal and the contentment that they deserve,” said Pulido in his speech delivered by Romero. E-POWER MO - to develop and utilize energy resources available to Filipinos for wealth creation and global competition. E-SAFETY - to undertake safety and savings measures through energy efficiency. E-SECURE - to secure the delivery of quality, reliable and affordable energy services. E-DISKARTE - to empower consumers through a wide range of options in utilizing conventional, renewable and alternative energy sources. 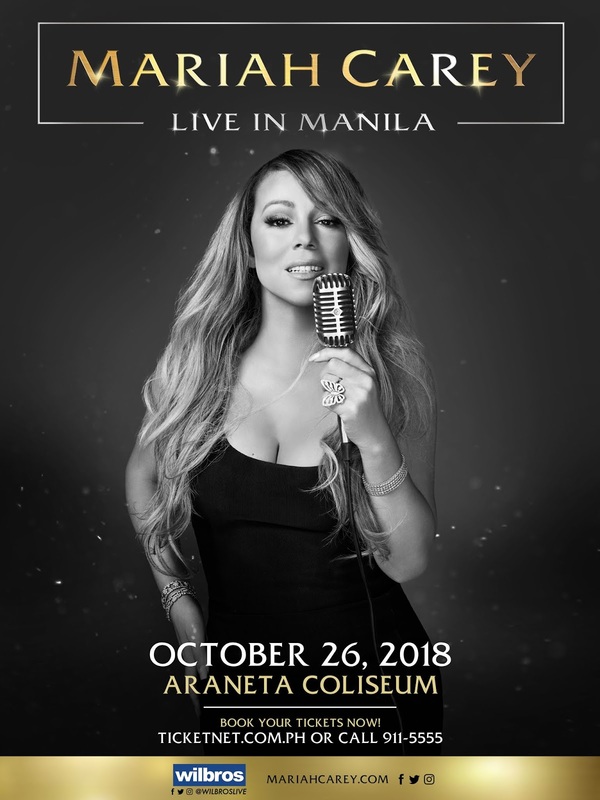 Mariah Carey is the best-selling female artiste of all time with more than 200 million records sold worldwide to date and eighteen Billboard #1 singles (seventeen self-penned) including ‘Hero’, ‘Fantasy’, ‘Always Be My Baby’, ‘Honey’, ‘One Sweet Day’, ‘Without You’, ‘Touch My Body’, ‘We Belong Together’, ‘Don’t Forget About Us’ and the global smash hit Christmas single ‘All I Want for Christmas Is You’, more than any solo artiste in history. With her distinct five-octave vocal range, prolific song writing, and producing talent, Mariah has defined the modern pop performance. As a singer, songwriter and record producer, she has been recognized with five Grammy Awards, nine American Music Awards, Billboard's "Artist of the Decade" Award, the World Music Award for "World's Best Selling Female Artist of the Millennium," and BMI's "Icon Award" to name a few. We all have our dream homes, but not everyone believes that they can come to life. If you are on the look for that dream house of yours, here are some important factors to deliberate over before investing. What is your dream house? Is it an apartment, a condo unit, a townhouse, or a simple bungalow-type? How many rooms will it have? Will your home require a big space? Would you need a guest room? Will it give off a modern, minimalist, or rustic vibe? It is important to think these tiny details through when deciding to buy a home. It is your dream house, after all. The way our home looks affect the way we feel and perform. Assess yourself which of these are your top priority. 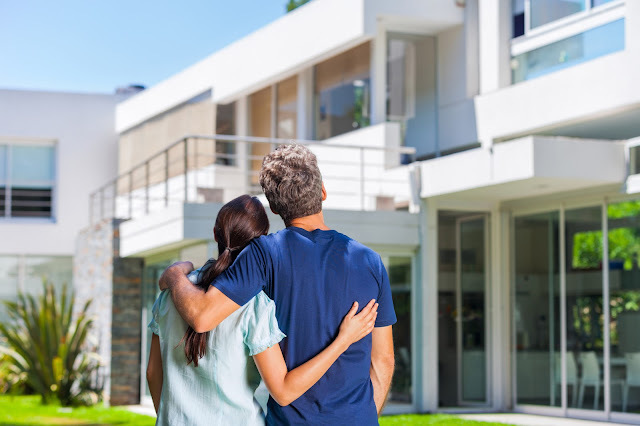 Buying a house is considered as the most important and most expensive decision one would ever make in his/her life so might as well go for the best and for what you really like. Learning what you want and what will make you feel comfortable and ‘at home’ early prepares you for the possible expenses you are about to encounter. You can buy a house and renovate it to meet your ideal home style, but you can never ever change a home’s location once the decision is done. Location is one of the most important yet often disregarded aspects of buying a home, especially when practicality comes first. Most oft thetime the best locations also have the ‘finest’ price, which results in simply settling down to what is ‘okay’. You can choose the type of house you want to live in, but never forget that you can also choosewho your neighbors will be and what kind of community you are willing to take part in. Being atpeace and at ease with your surrounding makes the house a home. access to these CBD perks. Now that you have clearly painted in your head your future dream house in the best location possible, the next concern is how can you afford it? Money matters, especially in terms of buying a property, sound overwhelming. Let this not make you think that you don’t deserve a house you cannot afford as of the moment. Interest rates and terms for housing loans differ from one option to another. Carefully study all your available options and assess which one would work best for you and your budget. How critical is it for you to have your own place? Is it urgent? Or do you still have time to save up? Timing plays a critical role in decision-making because it will determine what your next actions would be. 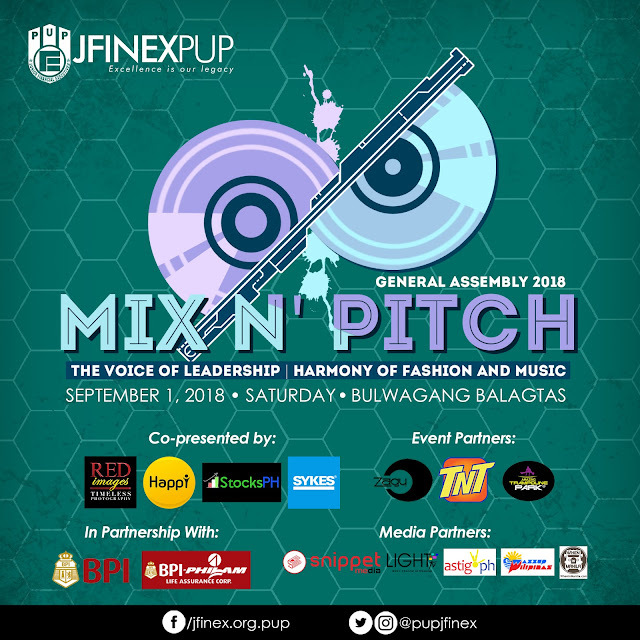 The Junior Financial Executives – PUP Manila welcomes the new Academic Year through a general assembly with the theme: “Mix ‘N Pitch: The Voice of Leadership | Harmony of Fashion and Music”. This will be attended by the 1300 members of the organization and it will happen on September 1, 2018 at the Polytechnic University of the Philippines, Sta. Mesa, Manila. This will be a two-installment event. First installment will be a seminar-type program that will feature the showcasing of talent of JFINEX’s sub organizations, recognition of Dean’s Listers, launching of the General Plan of Activities of JFINEX for the entire academic year and more activities that our members will surely enjoy. The second installment will be a Music festival-type of party with loud music and different kind of booths. This event will be held to give the members a chance to take a break from their academic responsibilities and enjoy and relax for a while. a lasting impact not just to its members but also to the whole PUP Community. The Maritime Industry Authority (MARINA) stirs local cruise shipping industry as it endorses the acquisition and operation of cruise ships in the Philippines. “We are encouraging companies to operate cruise ships in the Philippines. By stirring the cruise shipping industry, we aim to advance local maritime industry through the boosting of Philippine tourism,” MARINA Administrator Rey Leonardo Guerrero said. However, despite the advocacy to venture into local cruise shipping industry, the MARINA assures it will be uncompromising in the regulating the industry. Come September 2018, the MARINA will implement strict policies for the acquisition and operation of local cruise ships to ensure maritime safety and security, one of which is the rule on the accreditation of cruise ships. To guarantee the quality of ships plying over the Philippine seas, the MARINA will only accredit cruise ships that are operational for not more than 20 years. Moreover, cruise ships, whether newly-built or previously-owned, are required to be classed by the International Association of Classification Societies (IACS) to warrant its adherence to technical standards and requirements, ensuring maritime safety and environmental protection. While all Philippine cruise ships are required to be manned by Filipino seafarers, the MARINA is open for granting special permits to foreign cruise ships to engage in local cruise shipping industry in areas that are not serviced by local cruise ships. "Santa Nena!" tells the story of a miraculous patron saint (Elora Españo in the titular role) who springs to life at night. One day, while talking to her friend, an angel (Jelson Bay), she received a message from God. She has to be the child-bearer for the second coming of the Messiah on earth with Manuel (Ross Pesigan), “the boy with the golden balls.” Fellow thespians Mailes Kanapi, Rolando Inocencio and Martha Comia play supporting characters. "In Philippine culture, having devotion to a saint or patron is a huge part of it. Most people believe in the miracles of different patrons of the church to accommodate their request. But what if the situation turns around and saints were to ask people a favor? Will the people grant a saint’s request? 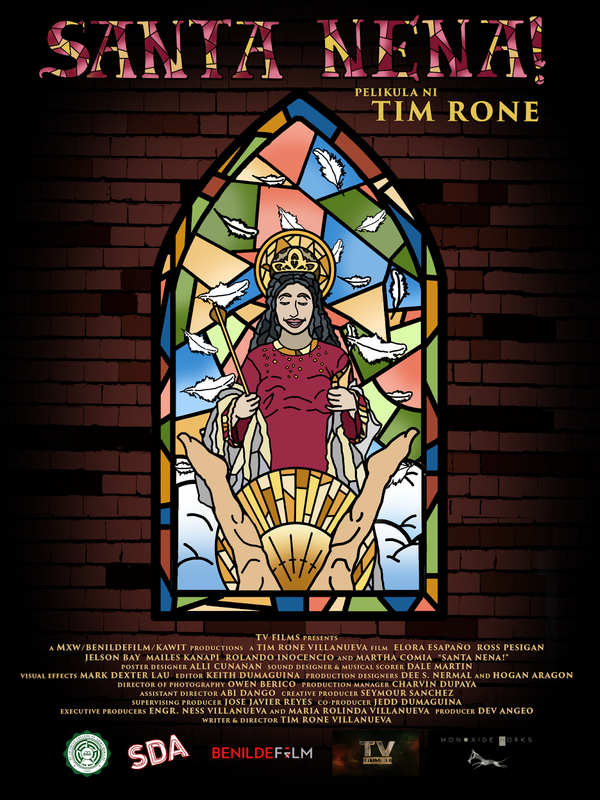 This film challenges what happens if you reverse the situation of men and saints," the young filmmaker explained. "Santa Nena!" was also screened last July 5 at the DLS-CSB SDA Cinema as part of the One La Salle Film Festival. 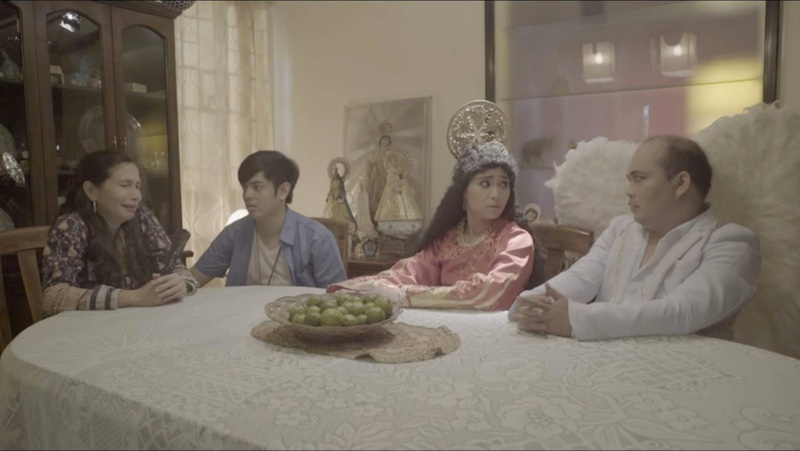 Last year, it figured prominently in two film events in Mindanao -- competing at the Philippine shorts competition of the fifth Salamindanaw Asian Film Festival in General Santos City and being part of the official selection of Cinema Rehiyon 9 in Nabunturan, Compostela Valley. 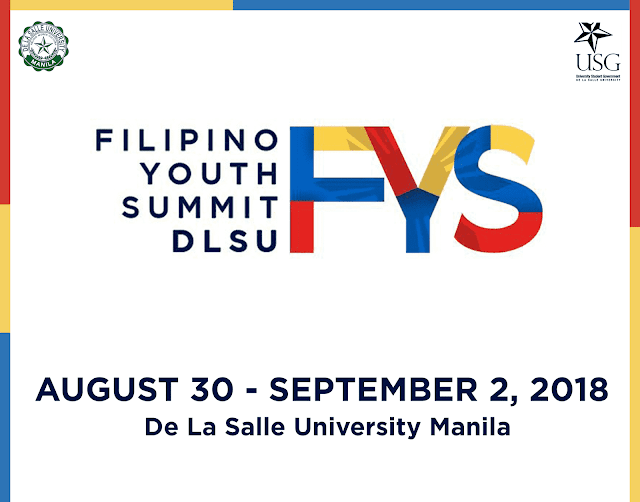 For the first time, the Office of the Vice President for External Affairs (OVPEA) of the University Student Government is organizing the first Filipino Youth Summit, an advocacy-based youth conference in the country where student-leaders gather to participate in reviewing local and national government initiatives, addressing national issues, and collaborating towards a more empowered and progressive nation. The summit will be composed of collaborative discussions, and issues-centered talks to further unite the Filipino Youth of common interest. The summit will be divided into 5 pillars and composed of mainly: Business Ethics, Education, Environment, Human Rights, and Public Health. Each delegate will thoroughly discuss specific issues in relation to ther respective pillars. In addition an activity entitled “Cross Talks” will be facilitated wherein 5 distinguished guests are invited to discuss relevant topics outside the 5 pillars of the conference. These topics outside the pillars aim to engage and focus the youth into adapting better lifestyles, addressing other issues the best way they can, and improve themselves in society today. It will feature topics on healthy living, solid waste management, maximizing social media platforms and building a career at a young age to name a few. This coming August 30-September 2, the very first FILIPINO YOUTH SUMMIT will be pioneered by outstanding Filipino students all over the world. LIQUID FUEL INSPECTION: Members of the Focused Inspection Team evaluates a gasoline station in San Juan, Siquijor. The Department of Energy (DOE) recently concluded another round of compliance monitoring inspections for establishments involved in the distribution and sale of petroleum products in the provinces of Negros Oriental and Siquijor on 13-17 August 2018. The “Focused Inspection (FI) on the Downstream Oil Industry” was conducted in partnership with concerned Local Government Units (LGUs), the Department of Trade and Industry, the Department of Science and Technology, the Philippine Information Agency, the Bureau of Fire Protection, and the Philippine National Police. Spearheaded by the Energy Industry Management Division of the DOE-Visayas Field Office (VFO), the FI seeks to ensure that all petroleum products being sold in the market adhere to national quality and quantity standards that protect the consumers. A total of 162 liquid fuel retail outlets and 115 liquefied petroleum gas (LPG) establishments were inspected. It was revealed that 84 percent of liquid fuel retail outlets operate without the Certificate of Compliance required by the DOE. For the distributors of LPG, about 98 percent of the LPG establishments are without Standards Compliance Certificates in violation of the Amended Retail Rules and LPG Industry Rules. Furthermore, 11 percent of the total liquid fuel retail outlets inspected was found to have under-delivering dispensers. These were immediately referred to the LGUs for immediate corrective measures, without prejudice to the appropriate cases that may be filed later. 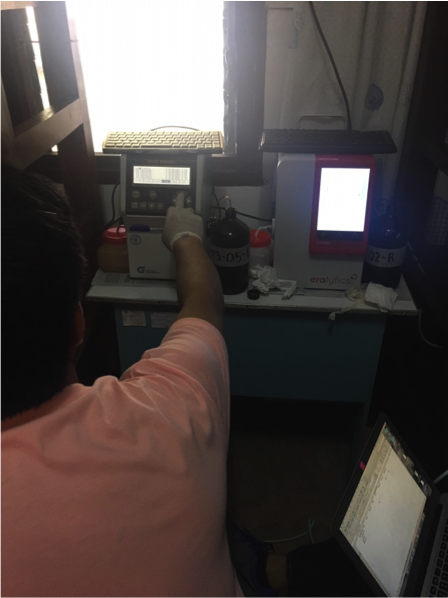 The DOE-VFO regularly conducts compliance monitoring activities throughout the Visayas to uphold the welfare of consumers in the region. LAB TEST VERIFICATION: Samples collected from inspected establishments are brought to the DOE’s laboratory for further testing. 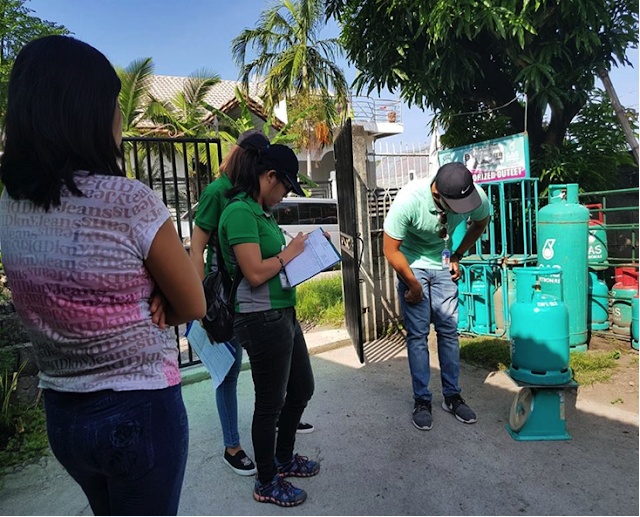 ENSURING LPG QUALITY AND QUANTITY: Members of the Focused Inspection Team examine an LPG cylinder to determine its compliance with national quality and quantity standards. 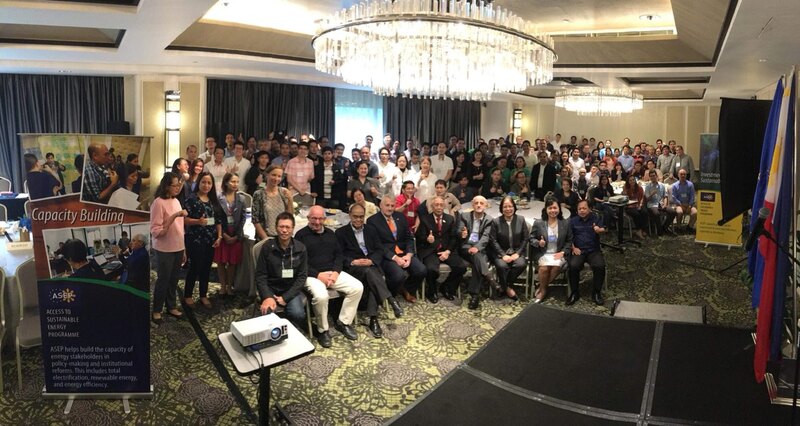 COMING TOGETHER FOR ENERGY EFFICIENCY: Department Of Energy officials along with EU-ASEP leaders and staff pose for a group photo with industry players for the lighting and appliance industries. The Department of Energy (DOE) in partnership with the European Union Access to Sustainable Energy Program (EU-ASEP) conducted the forum on “Directing the Compliance with the Philippine Energy Standards and Labeling Program (PESLP)”, for the final presentation of the Implementing Guidelines of Department Circular (DC) No. DC2016-04-0005 on 24 August at the Makati Diamond Residences. The draft DC entitled, “Declaring the Compliance of Importers, Manufacturers, Distributors, and Dealers of Electrical Appliances and other Energy-Consuming Products with the PESLP as a Policy of the Government”, was presented to ensure that said items being sold in the market adhere to Philippine minimum energy performance standards. “The PESLP is vital to the DOE’s E-Power Mo! 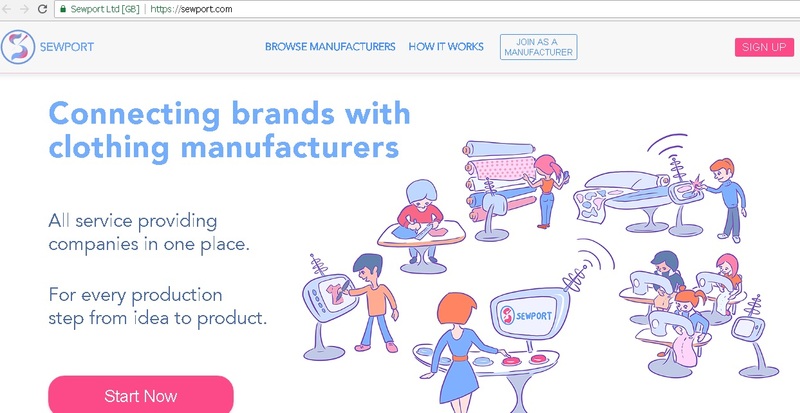 Movement as it provides consumers with the energy ability to make informed choices. Proper labeling of appliances will bring greater understanding of power consumption, thereby encouraging people to adopt more energy-efficient lifestyles,” said Energy Secretary Alfonso G. Cusi. A total of 131 participants attended the forum, which included representatives from the Department of Trade and Industry, appliance manufacturers and retailers from the private sector, as well as members of the academe. An overview of the PESLP was presented, followed by two breakout sessions on Lighting and Air-Conditioning. Prior to the event, the DOE conducted public consultations nationwide from March to December 2017 to come up with the Implementing Guidelines. The event was made possible through the technical support of the energy efficiency experts of the EU-ASEP led by Programme Manager Willy Hick alongside the Energy Utilization Management Bureau and the Energy Research and Testing Laboratory Services of the DOE. “It is important for consumers to be made aware of the products and appliances that bring more value for their money,” Cusi concluded. 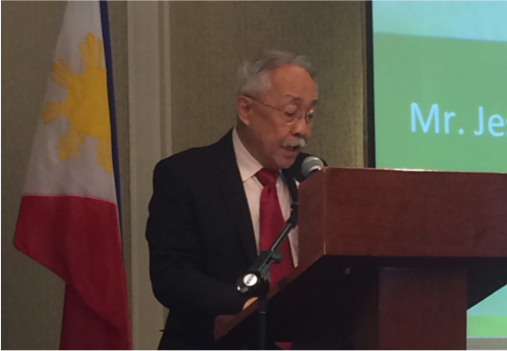 INTENSIFYING ENERGY EFFICIENCY AND CONSERVATION: Senior Undersecretary Jesus Cristino P. Posadas delivers the keynote address during the Final Presentation on the Implementing Guidelines for DC2016-04-0005 at the Makati Diamond Residences on 24 August. 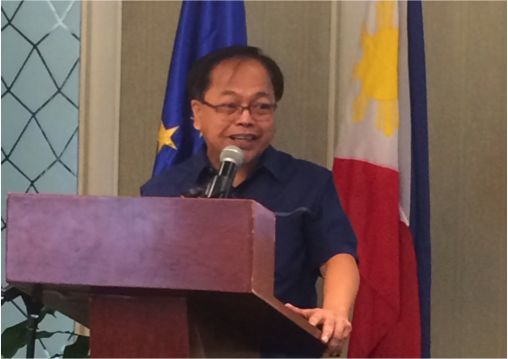 SOLIDIFYING THE ROLE OF THE DOE IN ENERGY EFFICIENCY: DOE-Energy Utilization Management Bureau Director Jesus T. Tamang presents the overview of the PESLP and how the labeling program would bring energy efficiency at the forefront with better informed consumers. 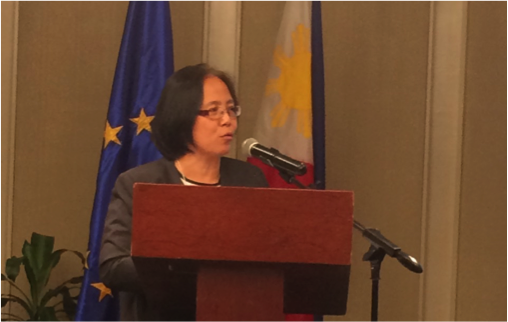 TIMELINE ON THE FINALIZATION OF THE IMPLEMENTING GUIDELINES: DOE-Energy Research and Testing Laboratory Services Director Amelia de Guzman discusses the timeline for the signing of the guidelines for DC2016-04-0005. The DOE aims come out with the signed guidelines within 30 days upon this culminating activity of the PESLP. 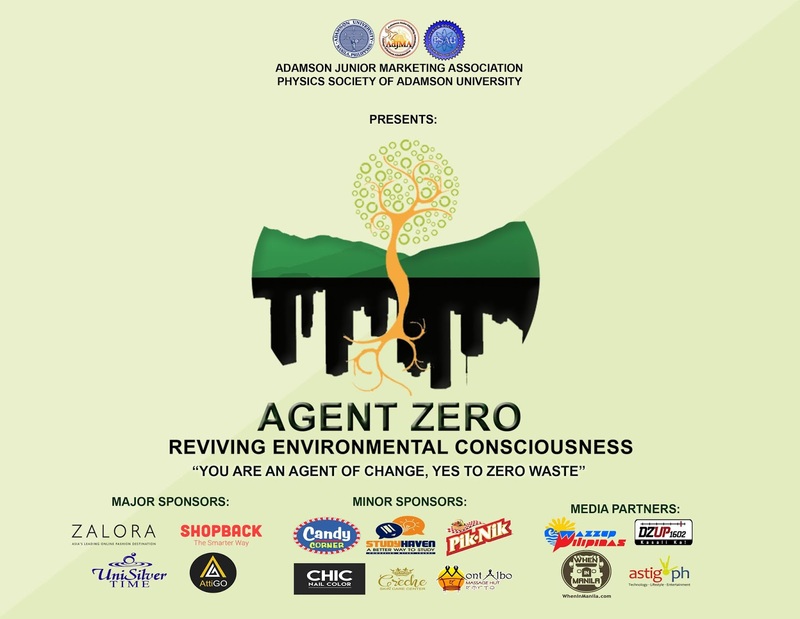 Agent Zero: Reviving Environmental Consciousness is an environmental activity that raises awareness, pursues an initiative for a zero waste lifestyle, and to act upon the advocacy to create sustainable actions for the betterment of the university. As another academic semester is about to unfold, Physics Society of Adamson University (PSAU) and Adamson Junior Marketing Association (ADJMA) envisions a year round of progressive actions and a disciplined community. The launch of the whole campaign will transpire on 2019. You are an agent of change. Yes to Zero Waste. Let us altogether be a catalyst of social transformation in our society. By the age of 14 she was writing on her own and teaching herself to play guitar, thus enabling her to develop more songs. At 15, her first serious solo creation wasMagic a song based on a personal experience, which she has chosen to share with us all. Her first release and Asia POP 4O’s recent BUZZ track, Best Friend was written as a parting gift to her best friend whose family moved to another country. 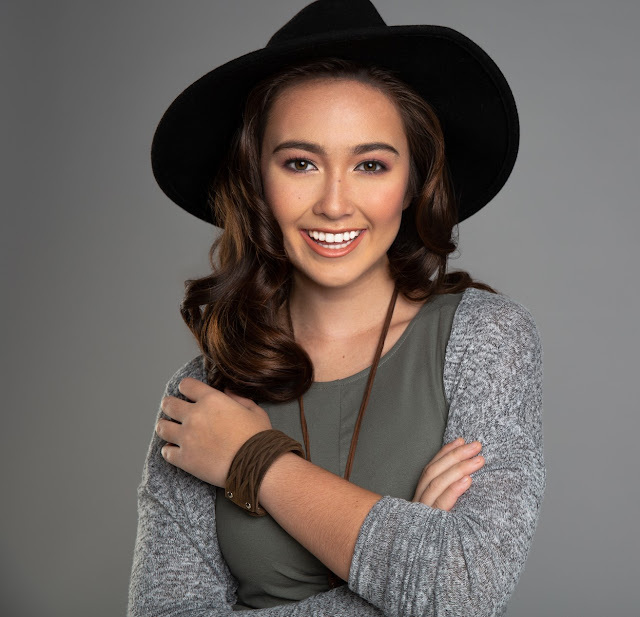 “I hope my music can help people through rough and difficult times, as it has helped me,” she states whilst providing an insight to her life story, which the young singer/songwriter describes as a somewhat “scary” experience. She cites both The Script and Ed Sheeranas the driving forces behind her love of songwriting and aspiration to continue performing. “It was simply a dream come true to be up there in front of such large audiences, and I enjoyed every minute,” she shared. lyric video ( link below). 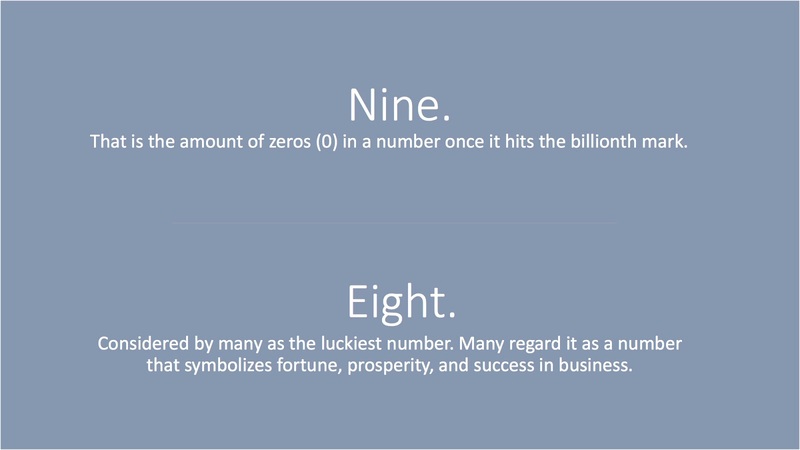 For the past years, I've been observing and dealing with several start up company around the world. 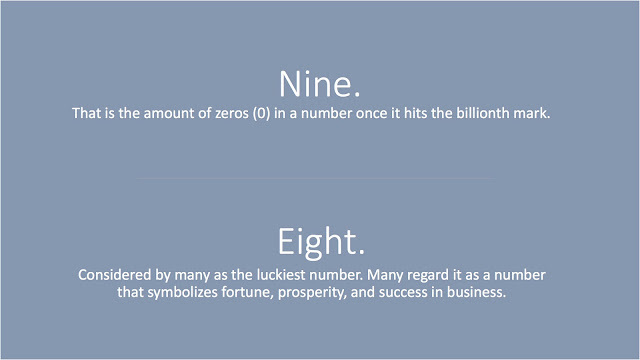 I've seen several start up founders talk about its craft in the Tech Summit. And how passionate and excited they are pitching as well as showing its unique masterpiece. Lately was last month, I've encounter great tech talks from several founders and grit tech enthusiast from different parts of the globe. As a common observation they wanted the be the next Jack, Mark, Elon or Jeff of the Tech business world. They were hungry in making solution to several problems. Observing and Dealing with Several Tech Start Ups made me realized that each creation will lead to another creation. And they always wanted to be cooler than the current one. There was a time when properly aligned chauffeur driven cars outside high-end hotels were associated with a marriage ceremony or some ambassador arrival. Time has changed considerably. The mindset of the common people is no longer confined to the erstwhile approach. The soaring oil prices consequently raised the taxi charges which has made people realize hiring executive chauffeur cars for a group of people is actually the best available alternative today. The approach is both practical and smart since nowadays hiring a chauffeured car is much affordable. Moreover, you get to experience the chauffeur driven services that comes along with the car. The impressive quality services that you will discover will only make you feel good about your decision all about writing assignments. The elegant services are worth a try. On a business meeting or some important occasion, you would not have to stress your mind driving the entire distance. Certainly, waiting for a taxi would not help you either when you are running short of time. Now there is somebody to take care of that even if you plan to travel during chilling nights. With a well-experienced chauffeur in charge, you will not have to worry about the journey from point A to point B. You will reach your destination well on time and with an undisturbed state of mind. The chauffeur provided is well trained to suit your purpose responsibly. 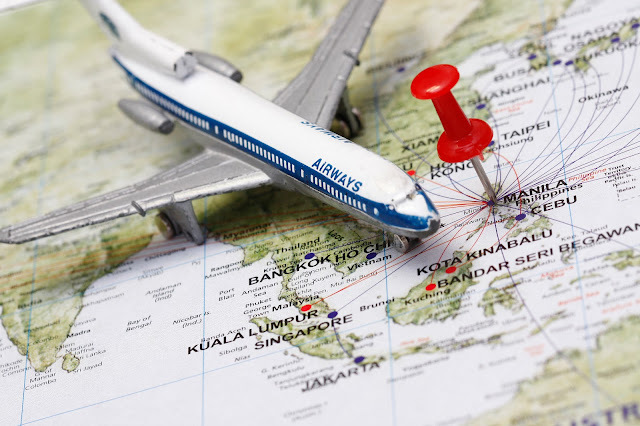 To reach the destination safely and staying punctual will be the foremost priority. The chauffeurs are accustomed to driving under the most demanding conditions. You will feel the service worth every penny of your expense. The chauffeur driven services will help you relax during the whole journey time. The car will be available at your front door at a pre-arranged time. All you need to do is choose a car from the range of opulent shiny executive chauffeur cars and provide the small important details. The excellent condition of the chosen exquisite car is guaranteed. There are lot of companies with glossy banners offering executive chauffeur cars like limousine and sedans. While looking for a name, the reputation of a company is the most important aspect that you must pay heed to. Paying up for inefficient services is preposterous. With the right car adding a touch of glamour to your journey, the VIP style treatment is in the store that you will love to relish. Putting aside all the hassle and commotion, you can now travel miles in the most hunky-dory way. Mindanao plays key role in gov't infra program. 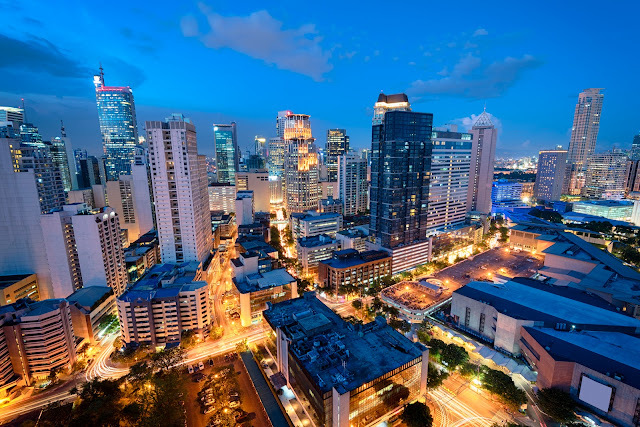 Under the Duterte administration's ambitious “Build, Build, Build” program, the infrastructure masterplan for Mindanao includes a number of expansion and modernization projects, as explained during the recently-held BDO Economic Forum in Davao. Speaking during the event are (left to right) Tomas Lorenzo, president and CEO of Torre Lorenzo Development Corp.; Transportation Secretary Arthur Tugade as keynote speaker; Edgar Saavedra, chairman of Megawide Construction Corp.; Vincent Perez, founder and CEO of Alter Energy Partners; and Eduardo Francisco, president of BDO Capital and Investment Corp.
RICH in economic resources, Mindanao is considered a key to a progressive Philippines. If further developed, the island region poses continued if not an unprecedented growth for the country, said Department of Transportation Secretary Arthur Tugade at the recently held BDO Economic Forum in Davao. The forum, which carried the theme “Progressive Philippines”, was attended by nearly 600 Davao-based businessmen who bank with BDO. Citing a World Bank study, Sec. Tugade said efforts to further grow the economy will be futile unless Mindanao is developed alongside the other regions. And progress, he added, cannot be achieved without first and foremost – infrastructure. “Every nation, every country, every region that has experienced growth and development is always predicated on the kinds of plans it has on infrastructure. And therefore, we say, unequivocally, you want development, let's have infrastructure. And therefore, we say, you want development in infrastructure, you do it also with Mindanao,” he said during his keynote speech. Under the Duterte administration's ambitious “Build, Build, Build” program, Sec. Tugade said the infrastructure masterplan for Mindanao include expansion and modernization of various airports, seaports, and maritime facilities, the development of the Mindanao Railway System, and the modernization of the region's public transportation system which will pilot test in Davao. All these are part of the P7-trillion budget the government has allocated for infrastructure spending until 2022. For instance, he said, airports in Cotabato, Dipolog, Ozamis and Pagadian are underway to be night-rated, which means people and cargo can travel to and from these locations even during the night. Sec. Tugade added another welcome development is the ground-breaking of the Bukidnon airport, which may happen by the end of the year and the near completion of the Cagayan de Oro Port new passenger terminal, which will be the country's biggest with a capacity of 3,000 passengers. 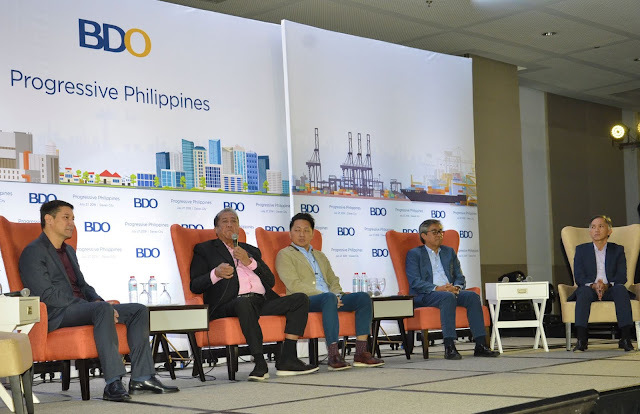 These infrastructure projects were welcomed by the invited panelists, namely, Edgar Saavedra, chairman of the Megawide Construction Corporation, Vince Perez, Founder and CEO of Alter Energy Partners, Ed Francisco, President of BDO Capital and Investment Corporation, the investment banking arm of BDO Unibank, and Tomas Lorenzo, president and CEO of Torre Lorenzo Development Corp. In lauding the efforts of the government, Lorenzo, a Mindanao native said, future investments in the region should also include education, technical and vocational education in particular to address the growing shortage in skilled workers. Based on experience, he said his company has to import skilled workers from Manila and Cebu, where many have relocated for a higher pay. He added the issue of perception should also be addressed, as Mindanao is “very healthy, wealthy and with Martial Law, safe”. Saavedra for his part underscored the importance of having a good working relationship with the government to avoid delays in the implementation of infra projects, thus called for the cooperation and support of the current administration.